The Castle Rock Police Cadets are non-commissioned, uniformed personnel that assist with various tasks throughout the department. They perform everything from office work and directing traffic to special events and crime scene investigation. The Cadet Program is aimed at people who are interested in the criminal justice and law enforcement field, but the life experience is good for everyone. In May 2017, Castle Rock Police Cadets took a tour of the Washington Criminal Justice Training Commission to see what police recruits do on a daily basis. Pictured (left) is former Cadet Chris Koehler. 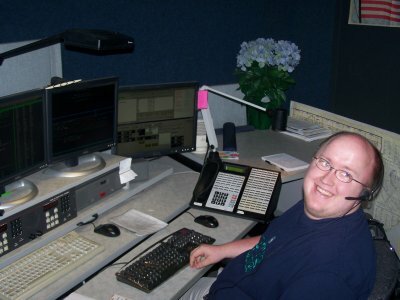 He is pictured here at his place of employment, the Cowltz County Communications (911) center. Chris was hired as a police and fire dispatcher there several years ago. Chris feels that his experience as a Cadet with Castle Rock is a major contributing reason he was able to become a dispatcher for Cowlitz 911. 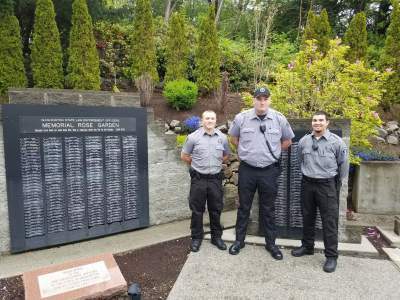 Pictured left are former Cadet Michael Huhta, now a Washington State Patrol Trooper and former Cadet Michael Delzell, now a Correctional Officer. 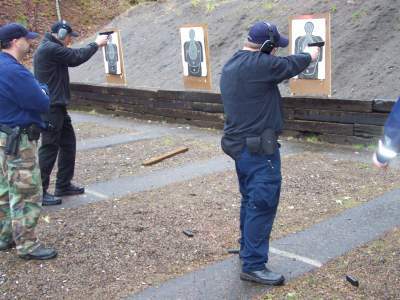 Cadets are taught safe firearms handling, proper technique, and other aspects of law enforcement training. They are supervised closely by other officers and instructors.